Fire ranks No. 5 among all boat losses, according to BoatUS Marine Insurance Program claims files. Dig a little a deeper, and those claims files also tell the six specific areas that lead to most reported boat fires. Since being forewarned is being forearmed, here are the top culprits and some tips on how to avoid them. 26% of fires are due to “off-the-boat” sources. 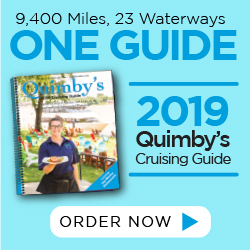 Over a quarter of the time, a BoatUS member’s boat burns when something else goes up in flames: the boat next to theirs, the marina, their garage or even a neighbor’s house. 20% of fires are due to “engine electrical.” For boats older than 25 years, old wiring harnesses take a disproportionate chunk of the blame. A good electrical technician can put one together for you, as most boats of this age had relatively simple systems. 15% of fires are due to “other DC electrical.” The most common cause of battery-related fires is faulty installation — reversing the positive and negative cables, or misconnecting them in series (when they should be in parallel). So, take a picture. Label the cables. Use red fingernail polish to mark the positive lug. Do everything you can to hook it up right. 12% of fires are due to “AC electrical.” Most AC electrical fires start between the shore power pedestal and the boat’s shore power inlet. Inspecting the shore power cord routinely (connector ends especially) and, for boats older than 10 years, inspecting or replacing the boat’s shore power inlet, could prove wise. 9% of fires are due to “other engine.” This one is all about when an engine overheats due to a blocked raw-water intake or mangled impeller, the latter of which can happen after experiencing a grounding or running in mucky waters. Be sure to check the engine compartment after getting underway and replace the impeller every other year. 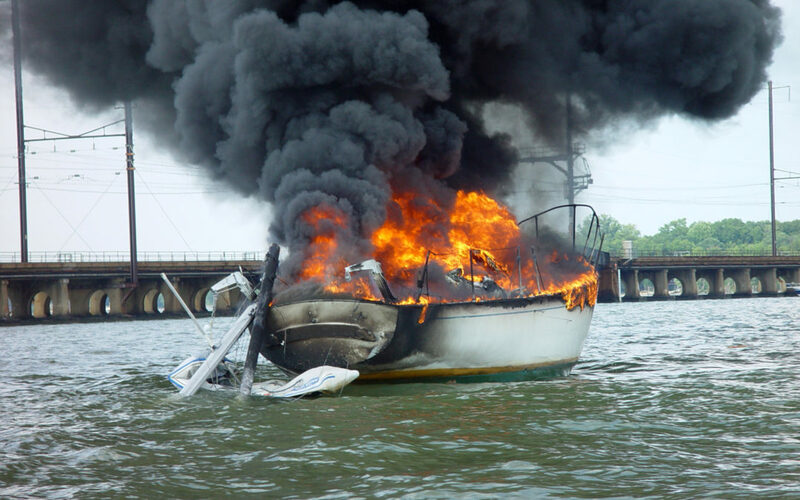 8% of fires are due to “batteries.” This fire fact is for the outboard folks: On older outboards, by far the most common cause of fire is the voltage regulator. At 10 years of age, failure rates on this important component begin to climb. Once it hits 15 years old, it’s time to replace. Find out more about the BoatUS Marine Insurance Program at 800-283-2883 or BoatUS.com/insurance. Is there anything written on grilling on boat. Not in the BoatUS study, but good question. We’ll keep our eyes out for relevant info.